You can dry most types of mushrooms successfully but not all of them. Some have a much better texture if you freeze them. 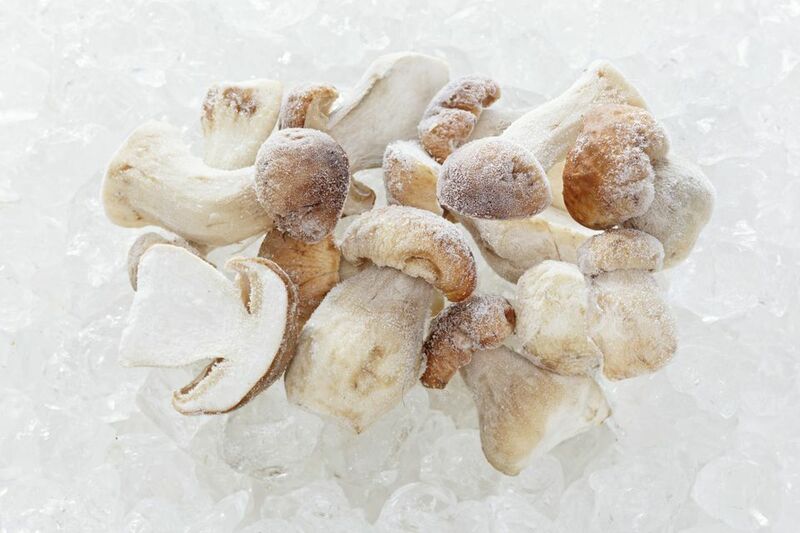 While some mushrooms are better cooked before they are frozen, others are fine to freeze raw. Grocery store button mushrooms, creminis, and portobellos (which are mature creminis) are cultivated mushrooms that can be frozen raw or cooked. Hen of the woods mushrooms and maitake mushrooms freeze well raw. Wild mushrooms in the slimy-capped Suillus genus are tasty, but they have such a high moisture content that they are almost impossible to dehydrate well—they are definitely better preserved by freezing them raw. With both raw and cooked mushrooms, the goal when freezing them is to prevent the mushrooms from sticking together in a big clump. When it comes time to use them in a recipe, you want to be able to take out just what you need and not have to thaw an entire brick of frozen food. With raw mushrooms, freezing them in a single layer first before packaging them prevents that problem. Clean the freshest mushrooms you can find. Avoid any mushrooms with dark spots, any that are shriveled and any that have an unpleasant odor. Chop the mushrooms into slices or dice them. You can always chop them up smaller when you use them. For now, just aim for pieces that are no more than 1/2-inch thick. Spread the mushroom pieces in a single layer on a cookie sheet or large plate. It is okay if the pieces touch, but they should not overlap. Freeze for 2 hours. Transfer the frozen mushrooms to freezer containers. Because they were frozen in a single layer first, the pieces stay loose and individual in the containers. Grocery store button mushrooms, shiitakes, and wild mushrooms including oyster, chicken of the woods, and tooth mushrooms have a better texture when you finally use them if they are cooked before they are frozen. Chop the mushrooms into small pieces or slivers that are less than 1/2-inch thick (you'll be cutting them up into smaller bits than for the raw method). Heat a little oil or butter in a skillet over medium-low heat. Add the mushrooms and cook, stirring often, until the mushrooms first release their liquid and then reabsorb it. You can also prepare the mushrooms by steaming them first. Wait for the cooked mushrooms to cool to room temperature. Transfer the cooled mushrooms into small freezer containers that are no larger than 1-cup size. Alternatively, put the mushrooms into freezer bags in a layer not more than 1/2-inch thick. Store the freezer bags horizontally. What you'll end up with is a frozen mushroom "pancake" that you can easily break up into pieces to take out only what you need.